Graduate student Lisa Winters holds a mature tiger trout. 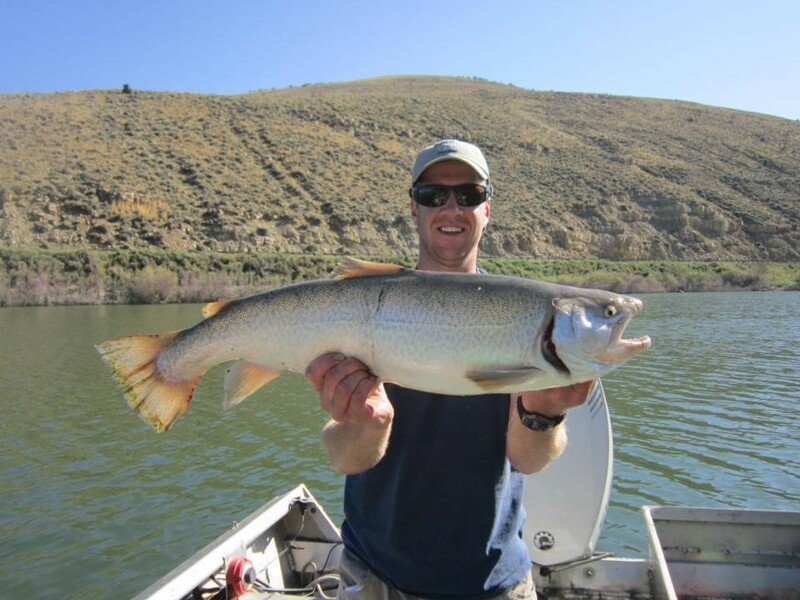 Trout grow quickly when they are on a Utah chub diet. 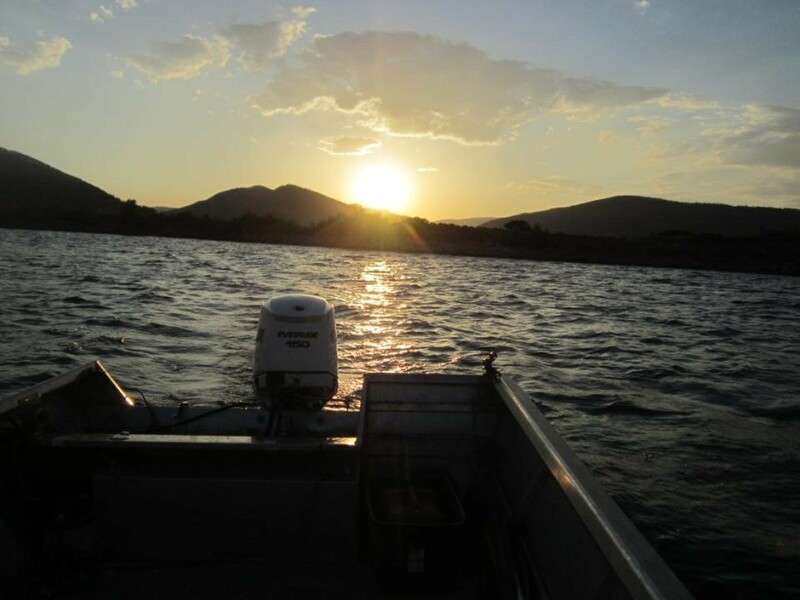 Scofield Reservoir (a 2,815-acre, man-made lake), has, “Historically [been] the most important trout fishery in Utah’s southeastern region…” says Dr. Phaedra Budy, Unit Leader for the U.S. Geological Survey Cooperative Fish & Wildlife Research Unit at USU. 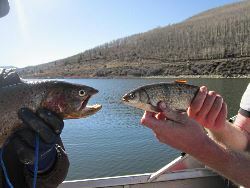 The trout (tiger, cutthroat and rainbow) now share the reservoir with high densities of Utah chub. The reservoir is thick with chub – a carp-like fish that matures quickly and is extremely prolific. At times chub have outnumbered trout in Scofield Reservoir nine to one. The Utah Chub is native to the state, as indicated by its name, but it wasn’t observed in the lake until 2005. The main concern for fisheries managers is whether or not the growing population of chub will compete with sport fish for food and/or space, as has been observed elsewhere, or whether chub can be effectively controlled by trout populations. Undergraduate student Konrad Hafen holds a mature Tiger trout which preys on the Utah chub. 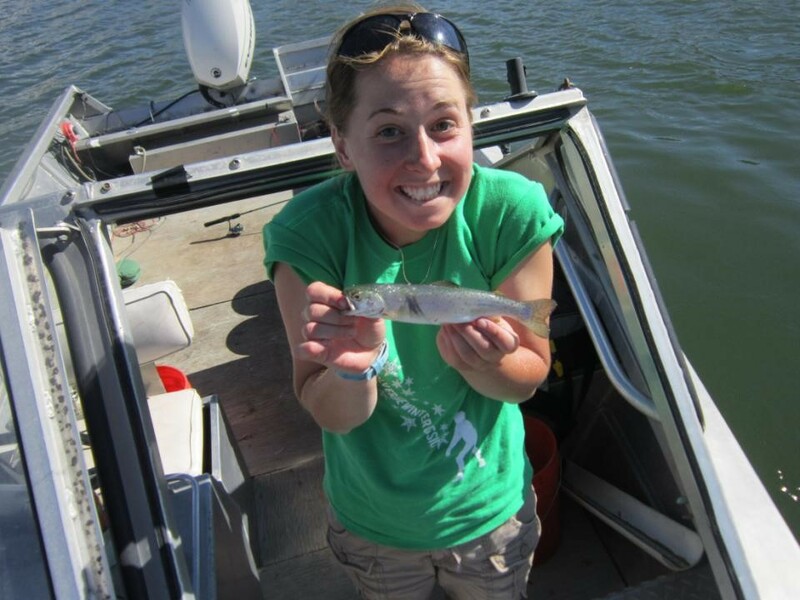 In an effort to answer these questions, Utah Division of Wildlife Resources (UDWR) commissioned a multi-year research project with Dr. Phaedra Budy’s Fish Ecology Lab in the Department of Watershed Sciences, Quinney College of Natural Resources to determine the predator and forage relationships between the trout and chub. 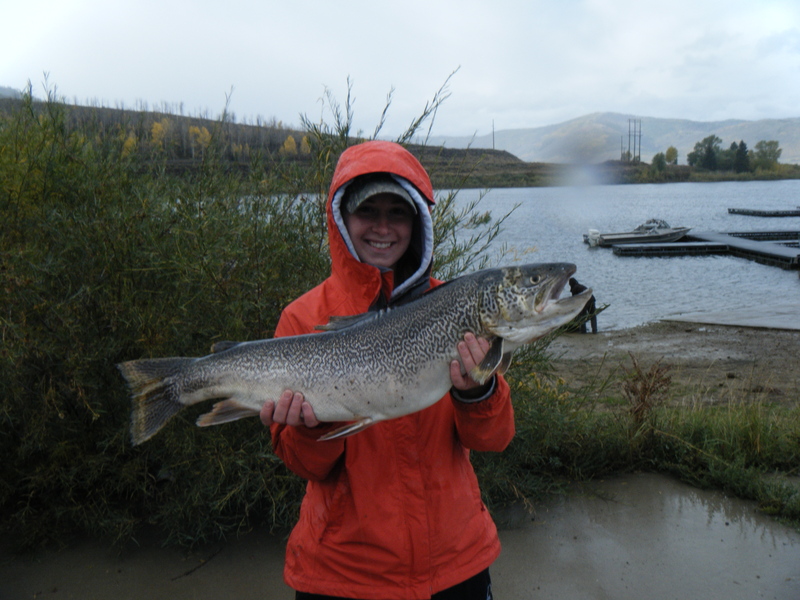 Based on this USU research, one observed benefit of chub is the impact it has on the growth of trout that eat it. 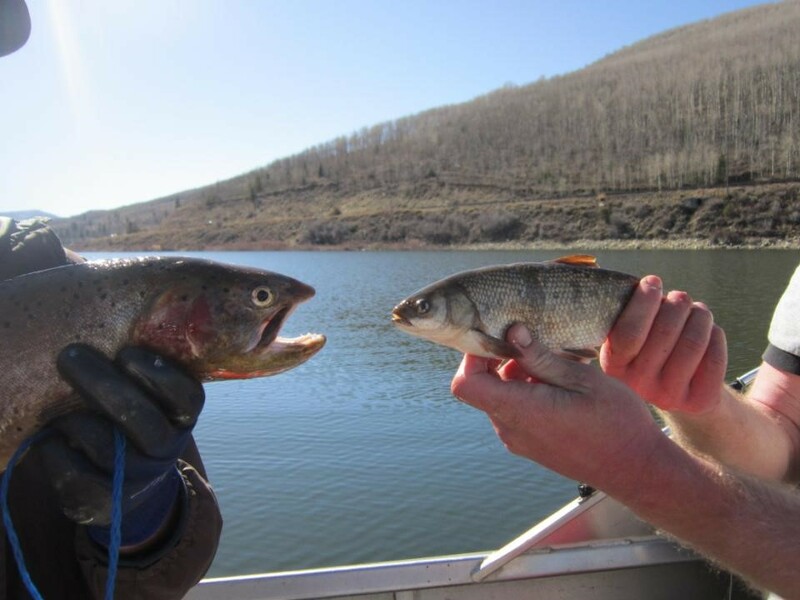 After stocked tiger and cutthroat trout reach a certain size (usually a year after being stocked) they switch to a diet of fish and begin eating the chub. According to Gary Thiede, fishery biologist in the Department of Watershed Sciences, once the trout begin eating chub they grow rapidly. Tiger trout in particular grow to very large sizes eating a diet of 100% chub. The chub may, therefore, be beneficial to the reservoir’s ecosystem if the numbers are controlled. DWR has used three trout species to control the population of chub and also enforced a catch and release rule for larger cutthroat trout so the biggest predators would remain in the reservoir. But since chub can live up to 30 years, some of the adults have reached a size where they are too big for trout to eat. 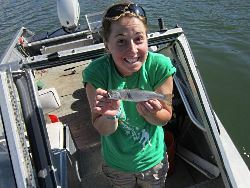 Graduate student Lisa Winters holds a tiger trout likely stocked earlier that spring. It takes at least a year before the stocked fish grow big enough to begin preying on the chub. In 2016, it became obvious the public would no longer tolerate waiting for the trouts’ appetite to decrease the chub population. After an extensive public input process, of gathering over 2500 public angler surveys, a committee was formed comprising of Scofield residents, sportsmen organizations, and wildlife agencies to develop a management plan, which would provide DWR recommendations to control the Utah chub population and create a sustainable, high-quality fishery at Scofield. 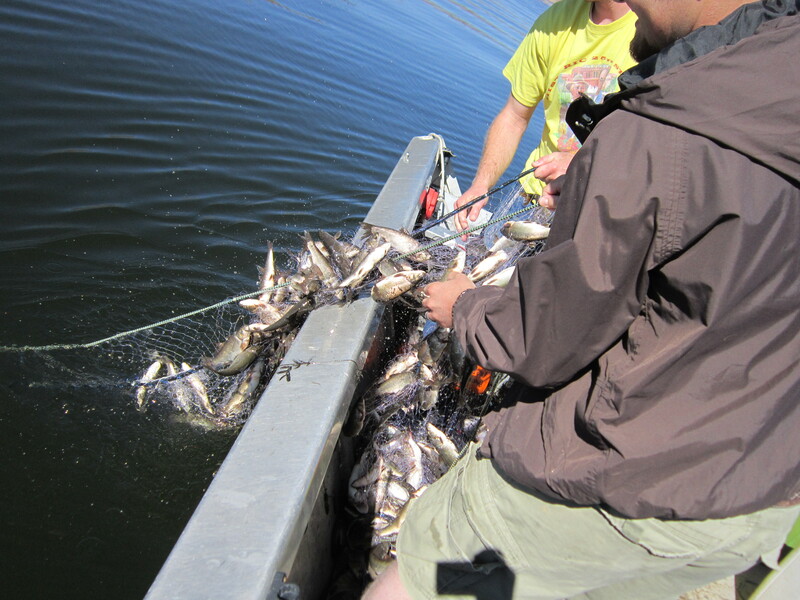 Research technicians pull in a net full of Utah chub. The plan was reviewed and approved by the Central and Southeast Regional Advisory Councils. The first step in the plan will be DWR introducing three new fish to Scofield: wiper (a hybrid of white and striped bass), tiger muskie and triploid walleye. 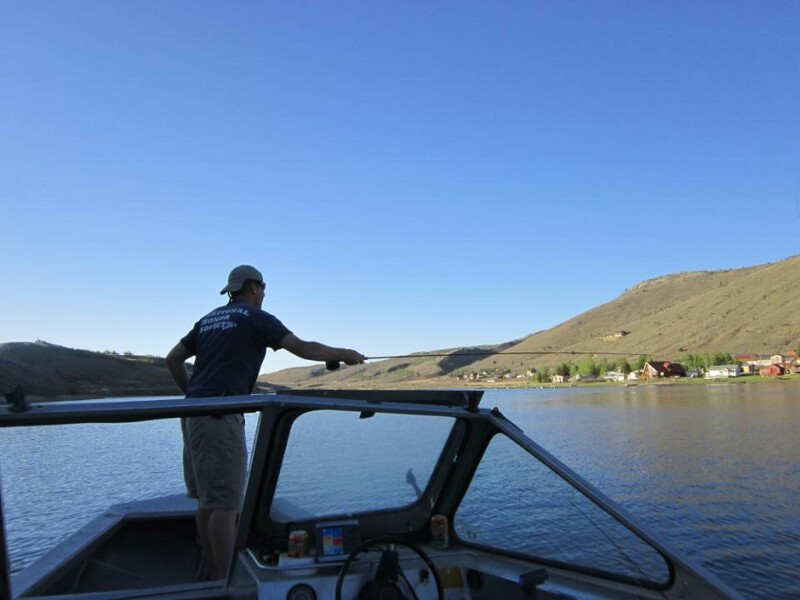 Justin Hart, the DWR’s aquatics manager in southeastern Utah said, we don’t want to completely eliminate [the chub], but we do need to get their biomass down. We plan to use the chub to grow some big fish. 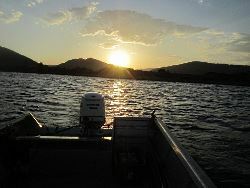 Once the chub population has dropped, DWR will resume stocking the rainbow trout – a favorite among the state anglers. If the plan is successful, the chub population will remain at a sustainable level and be a benefit, instead of a burden to the Scofield Reservoir trout populations.